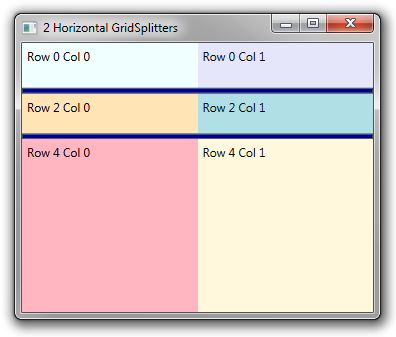 You can include both a vertical and a horizontal GridSplitter in a Grid. 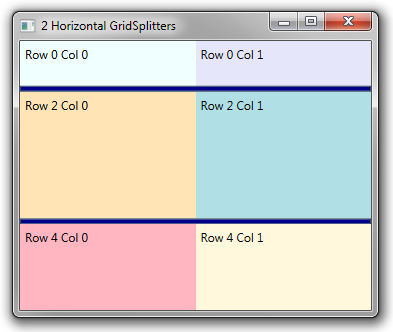 You can also include multiple horizontal or multiple verticial GridSplitter elements in the same Grid. Here’s an example with two parallel horizontal GridSplitter elements. The user can change the size of any of the three panels by clicking and dragging either of the two GridSplitters. <GridSplitter Grid.Row="1" Grid.ColumnSpan="2" Height="6" BorderThickness="1"
<GridSplitter Grid.Row="3" Grid.ColumnSpan="2" Height="6" BorderThickness="1"